Aug. 24, 2016. The birth of the #IAM911 movement. I was in Florida for the national Association of Public-Safety Communications Officials conference and had heard about the reclassification issue that was originally started by APCO. They proposed that the Office of Management and Budget change 911 dispatchers from their current classification under “clerical” to the more appropriate “protective” class, the same as police, fire and EMS. After looking at what both organizations were doing, I decided to insert myself in the fight by focusing on one of the elements that both organizations were looking for — stories. They wanted stories from dispatch to show how they differ from commercial dispatchers and clerical workers. Since I had been telling dispatch stories for a few years already, I felt it would be a perfect opportunity to assist. For me, however, I wanted it to be an in your face look at what dispatch deals with. I wanted to be blunt and I wanted to strike a chord. The story above is a mere glimpse into the call I took when I heard this teenagers’ last breath before he died. It’s simple yet powerful. I am reaching out to the deceased letting them know that I am the one that took the call; I am the one that was there for him and the family; I am 911. I asked others to do the same and share their stories anonymously to our inbox. I wanted to keep the authors anonymous, because I wanted them to feel comfortable in sharing their stories without feeling like they would get in trouble. Dispatchers don’t always like to talk about their stories. Some of them hold it in for years. I know. I was one of them. Overnight, stories poured in. I had four Facebook page admins and I quickly added two more to keep up with the inbox. We were flooded with stories on Facebook and I began to receive them on Twitter and see them tweeted and retweeted. That weekend, #IAM911 hit number three in top trending topics on Twitter. It hit Canada and spread across the pond to the U.K. and even further to Australia and New Zealand spawning, #IAM999, #IAM000 and #IAM111. The movement had busted at the seams and the most important person you will never see was in the spotlight. The stories were gut-wrenching, with some occasional happy moment. The majority are hard to read, but that’s exactly what I wanted. Stories also rolled in from the other side, too. 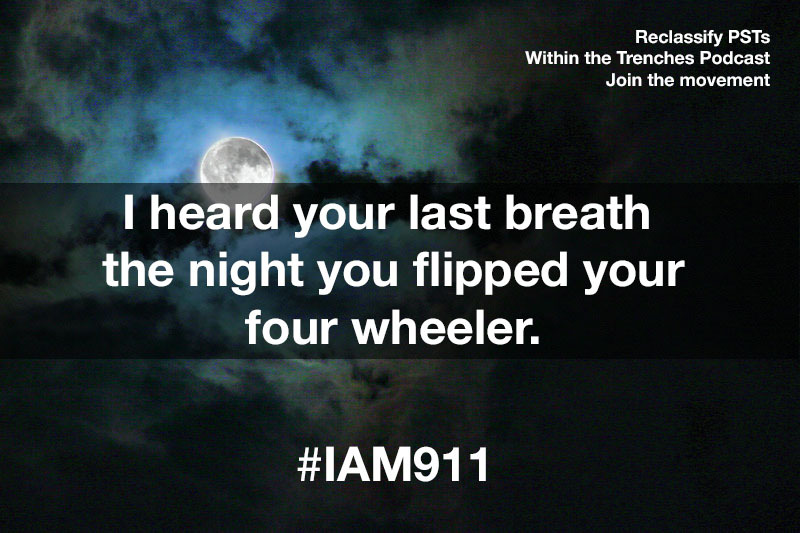 These are stories from the callers giving their side of an #IAM911 story. People were reaching out to the dispatchers who helped them. Even though they would never meet them, they wanted to thank them by sharing their story. As the movement continued to explode, the news media took notice and everywhere you looked there was a news story on the movement and what it stood for. For the first time in a very long time, they were reporting on dispatch from a different side. They showed what dispatchers go through, the calls they take and the stress of the job. This was needed. Whether it was for the reclassification issue or not it was needed. I have read message after message from all public safety, not just dispatch, saying that they are so happy about the movement and what it stands for. Others have admitted they have been holding in their stories for years and now have a way to get them out. The movement also shows how real PTSD in the PSAP is. I have spoken to many dispatchers who have told me that they suffer from PTSD. And even though reading the stories have been a trigger, it has also helped them heal and find closure by sharing their own stories. The movement has made quite an impact on my life. Between family, work, the podcast and the movement, I have been busier than ever before. I have encountered many people and I can’t explain how good it has felt to know that something I started with one story grew to be something meaningful. I don’t think I will ever know how this has touched everyone involved. I have developed a class for future conferences on the subject as well as a Project #IAM911 meetup for dispatchers to come, network and share their stories. The meetups will begin in Indiana, but will hopefully spread out to other states. I have even added an extension to the podcast called Imagine Listening, which features the stories of the #IAM911 movement. Human curiosity has kept the movement going, along with the entire thin gold line by sharing their stories. To date, my team and I are still responding to messages from late August 2016. On Facebook, the total engagements regarding the #IAM911 movement surpass 40 million. I am humbled and honored to be a voice in telling the stories of 911 professionals and I will continue to do so. There is much more to come, but this is it for now. Note: If you have an #IAM911 story to share please email wttpodcast@gmail.com or submit it to the Facebook podcast page.